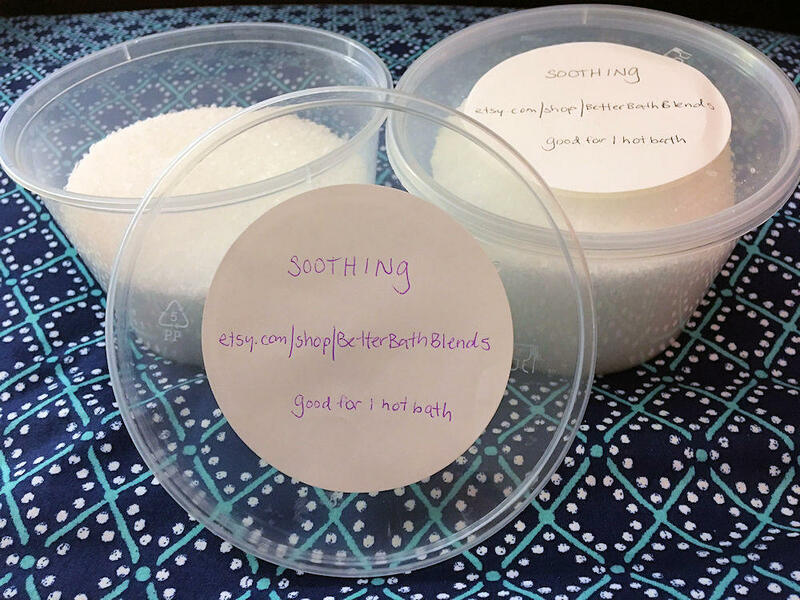 Each bowl contains enough SOOTHING Bath Blend for one hot bath. Directions: As you fill your bathtub with water, as hot as you can safely stand it to be, empty the container of SOOTHING Bath Blend under the running water. Mix the SOOTHING Bath Blend into the water until it is completely dissolved. Enjoy your SOOTHING bath for at least 20-30 minutes for best effect. Some ingredients are contraindicated for children under 12, women who are pregnant or nursing, and people who have high blood pressure, epilepsy, or an estrogen-dependent cancer. Some ingredients may cause skin irritation, but my sensitive skin does not react badly to SOOTHING Bath Blend. As a seller who carries a clinical diagnosis of an anxiety disorder and takes a nightly Epsom salt bath for relief from some of my chronic physical symptoms, it was of interest to me to find an essential oil combination that could help my baths soothe both mind and body at the same time. There is no fancy packaging in order to keep costs down for you. If you wish to give any of the Better Bath Blends line as a gift, you can find a decorative jar or other container that holds 15.2 oz, or message me to create a custom gift package for you. I am a spoonie and appreciate your support of my business. Google "spoon theory" if you are unfamiliar with the term. My particular diagnoses include: generalized anxiety disorder, major depression, PTSD, Asperger's Syndrome, chronic fatigue syndrome, fibromyalgia, polyarthritis, IBS, and various myalgias and neuralgias. It is because of these things that I wished to share some of the things that help me in my own bid for wellness. If you enjoy my Better Bath Blends, please leave a review after your purchase. If you find yourself placing multiple orders for the same product, please comment to let me know if you would like the ability to order a larger quantity. If you find that you enjoy Better Bath Blends enough to use them nightly and wish to recreate them yourself at a lower cost, please message me so I can get you set up as a customer with my essential oil supplier, for which I am a distributor.